Sefer Ozdemir Massachusetts valisi Deval Patrick ile 17 Ekim '08 de Turk toplumunu temsilen bulundugu bir toplanti sonrasinda. Ozdemir, Vali Patrick ile Ermenilerin Mass eyaletinde sozde Ermeni soykirimi ile ilgili tek yonlu yaptirimlarinin ve olumsuz etkilerinin yanisira daha cok insanimizin ticarete atilabilmesi icin hukumet'in sundugu imkanlardan nasil yararlanilabilecegi konularini konustu. Toplantiyi MDLM adina gerceklestirmekte onemli rol oynayan Kemal Bozkurt resim ortasinda. Turkiye Turklerinin yanisira, Ozbek, Kirgiz, KKTC, Kazakistan ve Azerbaycan Turkleri de Uygur kardesleriMizin yaninda idi. 11 Temmuz'da Harvard Square tarihte ilk defa Uygur Turklerinin yasadigi sorunlarla ilgili bir protestoya sahit olmustur. Turkiye, Almanya, Kanada, Azerbaycan, KKTC de ve diger ulkelerde yasayan siz kardeslerimizin de bulundugunuz bolgelerde benzer kinama protestolari yapmaniz tabiki gereklidir. Baska ulkelerin isgal ve / veya himayesi altinda yasayan Turklerin sahipsiz olmadigini gostermeliyiz; onlarin da insanca, huzur icinde kendi dili, kulturu ve inanclari ile yasamalarinin en dogal insanlik hakki oldugunu dunyay'ya hatirlatmali, bu haklarin ihlali durumunda var olan gucumuzle soydaslarimiza destek verebilmeliyiz. Hele ki bu durum bugun Dogu Turkistan'da goruldugu gibi bir katliama donusuyorsa, dunyanin neresinde olursa olsun butun Turkler yasadiklari ulkeleri ve vatandasi olduklari devletleri ayaga kaldirmak icin cabalamalidirlar. Ozellikle 7 bagimsiz Turk devlet yetkilileri hemen bir araya gelip diger ulkelerin himayesi altinda yasayan Turkler ile ilgili ortak bir siyaset gelistirmeli ve bunu acilen dunyaya duyurmalidirlar. Kendi himayesinde barindirdiklari Turkleri hor goren, onlarin insanlik haklarini ihlal eden, ve hele hele temel hak olan can guvenligini saglayamayan ulkelerle iliskiler yeniden gozden gecirilmeli ve 7 devletimiz ortak bir kararla gereken adimlari atmaladirlar. Sevgili kardeslerim, bir kere daha goruyoruz ki 7 bagimsiz Turk devleti arasinda birlik gereklidir ve gerceklestirilmelidir. Ancak ve ancak kuvvetli ve saygi duyulan bir Turk varligi diger ulkelerde yasayan Turklerin de yasam garantisi olacaktir. Dolayisi ile her Turk, nerede olursa olsun oncelikli olarak Turk Birliginin en kisa bir zaman icinde kurulmasi icin var gucu ile calismalidir. Videomuzda da vurgulandigi gibi bir cok milli sorunlarimiza ve dahi Dogu Turkistan sorununa da gercek ve kalici cozum Turk Birligi ile mumkundur. "Local Uyghurs protest in Harvard Square"
With a crowd of supporters extending bright blue flags toward the sky in the heart of Harvard Square on Saturday, Omer Kanat grabbed a bullhorn and stood above the crowd. “Uyghurs die, China lies,” shouted Kanat, as the crowd enthusiastically called back. “We want freedom,” Kanat barked again, once more echoed by the crowd. Kanat was one of many voices at the local protest, rallying a call to stop Chinese violence launched in recent days against Uyghurs, a minority group of eastern Turkic people living in China. 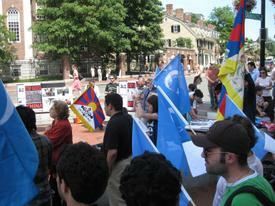 Saturday’s protest was organized in direct response to a July 5 incident in the Xinjiang region of China. On June 26, a mob stormed a toy factory in the Guangdong region, killing two Uyghur workers and injuring 118 others, according to a press release from the Uyghur American Association. Upset with the Chinese authorities response to the attack, many Uyghurs organized a protest in Urumqui (Urumchi), the capital of Xinjiang, on July 5. The Chinese government then deployed police to the protestors, resulting in over 800 Uyghur deaths, while more than 1,000 others were injured and over 3,000 were arrested, the press release said. The Chinese government claims 184 people have been killed in the violence. The man added these acts of violence were no sudden event, but something brewing for years. “Everything boiled and boiled, and then it blew up,” he said, adding Uyghurs have lived in China for over 1,000 years. A large number of protestors gathered besides the Harvard T-stop at the split of Massachusetts Avenue and John F. Kennedy Street to show their opposition to Chinese treatment of Uyghurs. While many carried their blue flags, the Uyghur symbol of East Turkestan independence, others held signs reading “Nazi China, Stop Massacring Uyghurs” and “Terrorist China Stop Killing Uyghurs”. When the protests keynote speaker, Kaiser Mejit, took the microphone, he outlined the escalation of the tension between Uyghurs and the Chinese government. Mejit also called for a peaceful end to the conflict, urging protestors to continue their opposition to the Chinese government, but in a non-violent fashion. Representatives of both the Chinese and Tibetan people also showed at the protest to voice their support for Uyghur rights. Jianli added that he hoped his attendance at the protest served as a symbol of all the Chinese people upset with the government’s treatment of Uyghurs. “I even got five calls from fellow Chinese friends who wanted me to pass on their support of Uyghurs,” he said. Linda Anna Mancini, a member of the Boston Tibet Network also showed up at the protest to “stand in solidarity with [her] Uyghur friends” and “ask the Chinese government to show restraint”. “A clash or protest is an inevitable result of government prejudice, especially if that group had faced years of oppression beforehand,” Mancini said. She added the Boston Tibet Network also wanted to further the need for a non-violence solution to the conflict. Before the circled protestors could once more continue their plea for freedom, Mejit had one last message for the Chinese government.